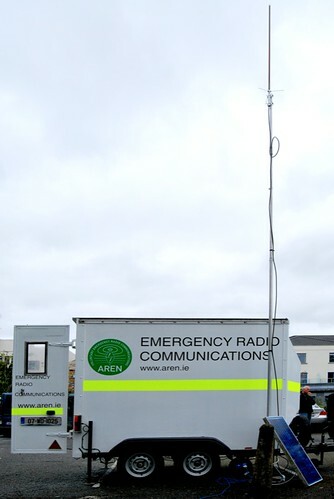 The 2009 Annual General Meeting of the Irish Radio Transmitters Society (IRTS) took place on Sunday 26th April in Athlone in the centre of Ireland. The outgoing President Father Finbarr Buckley EI1CS reported a successful year with an increase in membership to 974. This represents a good proportion of the estimated 1,500 radio amateurs licensed in Ireland. The incoming President, Paul Martin EI2CA, expressed his wish, that during his term in office that he can hopefully increase the profile of AREN in the country amongst both experimenters and members of the public. Several AREN members were present and some got a look at the MCP for the first time. All agreed that AREN has a basis on which to build a very functional mobile command post. frequency clear and avoid causing QRM. Thanks to all stations for their assistance and support. Last Sunday 11 AREN members assisted at the Galtee Walking Club‘s inaugural marathon challenge. Operations commenced at approximately 08:45 where a base of operations (manned by EI7IG and EI2GN) was set up to the left of the ‘start line’ at the entrance to the carpark. This was the first outing for the freshly painted “Mobile Command Post”. Once operational radio checks were completed and EI8FDB headed out with a SEMRA member to follow the walkers on the course. Shortly therafter, EI3FFB, EI2IT and EI3ENB headed out to man the first checkpoint at Moorabbey, at which time EI2JB headed out to begin setting up the second checkpoint. After the walkers completed the half marathon at base and some hardy souls headed off for the second loop. EI8JA and EI9HR accompanied SEMRA to a strategic location on the course, while EI5GPB and EI4GXB followed the walkers on foot as far as EI2JB’s location. Many thanks to SEMRA and Galtee Walking Club for extending the invitation to participate and their hospitality. “The Dipartimento Protezione Civile is only asking specialist volunteers to attend the disaster area. They are involving only 5.000 volunteers from very specialized teams used in similar emergencies. Practically all the repeaters and cell phone services are running! This is the reason a lot of communications support has not been called for. There is no official net on HF. However on 40/80m some hams from the Headquarters of Protezione Civile in Rome and Protezione Civile in L’Aquila are making spot contacts. Thousands of volunteers from several Regions are on standby and some specialist groups are making their way in convoy to the area. So to permit co-ordination of the arrival of emergency responders to the disaster amateurs are requested to exercise caution around 3640kHz LSB and 7040/7045kHz LSB and avoid causing QRM to those responding to this emergency.